Now that the holidays are only a few days away and the New Year is just around the corner, you are probably starting to think about the meals you are going to serve on these very special days. While the food you make should be the shining star of your table, you should also be thinking about how you will decorate the table before dinner is served. You may think you can’t afford to make anything fancy, but the truth is that beautiful table decorations can be very easy to make and affordable too! All you have to do is have a plan and give yourself a little time in the next couple of days to put it together. One great, cost effective way to decorate your table is with ribbon. Make a centerpiece out of old bows you’ve collected throughout the years, or wrap a few small boxes and arrange them strategically in the center of your table. 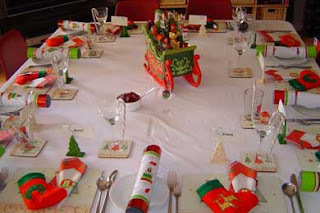 You can also decorate each place setting with left over ribbon from your gifts. Simply tie a large bow around your napkins and place them on each plate. Your table will look elegant and festive at a very low cost. Most people usually have some candy around over the holidays, so why not use them as decorations for your table? Place wrapped hard candy in a vase for a colorful centerpiece. Make new wrappers to place over chocolate bars with a picture and a name to use as place cards. Finally, candy canes are a very popular staple during this time of year. Arrange them in a bouquet or simply lay them on the table to add a little festive fun. Make your table shine with elegance with candles. They are very affordable, and they can make any room look a little better with great mood lighting. My favorite way to make candles work as a centerpiece is to place them on a mirror with a few other items, like a vase of flowers or a beautiful wreath. The candles themselves will light up the room, and the mirror will help them shine even brighter. Your children will love the attention they get when you decorate the table with their artwork. Not only is this option nearly free, it will also give your kids something to do while you prepare for family and other guests. Have them make a tree by coloring ornaments on a green piece of paper. Then wrap it into a cone to make the tree. You could also ask them to make actual ornaments for each place setting that you can put on the tree later. Let them be creative, and your table will look fantastic. Vanessa Lang is an author who writes guest posts on the topics of business, marketing, credit cards, and personal finance. Additionally, she works for a website that focuses on educating readers about payday loans.